Marc Dauphin - Marc DAUPHIN, MSM, CD, MDMajor (ret’d) Marc Dauphin was born in Montreal. He attended high school and CEGEP at Le Petit Séminaire de Québec (now Le Collège François de Laval), and studied medicine at Université Laval in Québec City. It was while he studied medicine that he enrolled in the Canadian Forces. Upon graduating, he served in Esquimalt BC, then in Lahr Germany. Upon completing his service, he practiced family medicine in Mont-Joli. Preferring emergency medicine, he moved to Rimouski where he worked in the ER and the ICU for eleven years. Moving to Sherbrooke, he practiced ER medicine there. He taught emergency medicine at both Laval and Sherbrooke Universities. He was also a coroner for 12 years. In 2007, the CF approached him to serve in Germany, as a reservist, at the US Armed Forces Role 4 hospital in Landstuhl where casualties from Iraq and Afghanistan were stabilized before being evacuated to North America. Concurrent to this mission of stabilization and organizing the Air-Evacuation for our injured soldiers, Marc Dauphin also suddenly took on the added responsibilities of being the Officer Commanding the medical clinic at Geilenkirchen, 300 Km to the north. The 6 month mission turned into almost a year. For this, he was awarded the Chief of Defence Staff Commendation.Upon returning to Canada, the CF once more approached him to take on the responsibility of being the last Canadian Officer Commanding the Role 3 NATO facility in Kandahar, Afghanistan. This he did, from April to October 2009, during a period where all records for numbers and severity of casualties were broken, mainly due to the Obama surge in troops. For this mission, he was awarded the Meritorious Service Medal which he received from the Governor General, His Excellency, the Right Honourable David Johnston, in 2011.From 2010 to 2012, Major Dauphin was Base Surgeon in the 41st CF Health Services Clinic, in St-Jean, Montreal, St-Hubert and Farnham. During this period, he appeared as a spokesperson for the CF in multiple media, printed, radio and video. From September 2012 to February 2013, he was the Regional Surgeon for Quebec, in charge of the Valcartier, Bagotville, and St-Jean clinics.Marc Dauphin retired from the CF in February 2013 because of age regulations. He has been married for 36 years, and has two adult sons, and two grandchildren. 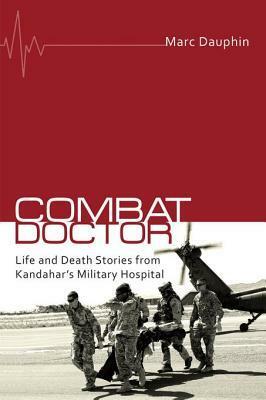 He is both a published author (L’anneau de Gabriele, Les Éditions Libre Expression, Montreal, 1998) and a painter.He will soon (Fall 2013) be publishing a book (Combat Doctore) about his experiences in Afghanistan. He hopes to begin teaching at La Faculté de Médecine de l’Université de Sherbrooke (The Sherbrooke University Medical School), in the fall of 2013. With his wife Christine, Marc Dauphin is engaged in writing a seven book series of novels about a German family throughout the XXth Century.Marc Dauphin earned the Meritorious Service Medal (MSM), The NATO Special Service Medal, the General Campaign Star, the Canadian Forces Decoration with bar (CD1), and a Chief of Defense Staff Commendation (2010).